Southern Regional’s Mike Gesicki signs his national letter of intent to attend Penn State on Wednesday. (Above) Gesicki’s sisters, Kelsey, 20, left, and Ashley, 24, tease him about his poor handwriting during a news conference in Stafford Township. Southern Regional's Michael Gesicki signed his national letter of intent to attend Penn State this fall. ... Gesicki played a position few fans noticed. As a freshman, he held the ball on extra points for the football team. "One of the most accurate statements I've heard is that high school goes by in the blink of an eye," Gesicki said. "I can still remember walking into high school my freshman year not even knowing where my classroom was going to be." From that modest beginning, Gesicki became one of the best athletes in school history. The 6-foot-6, 235-pound tight end/wide receiver will attend Penn State on a football scholarship. He leaves for Happy Valley on Friday. 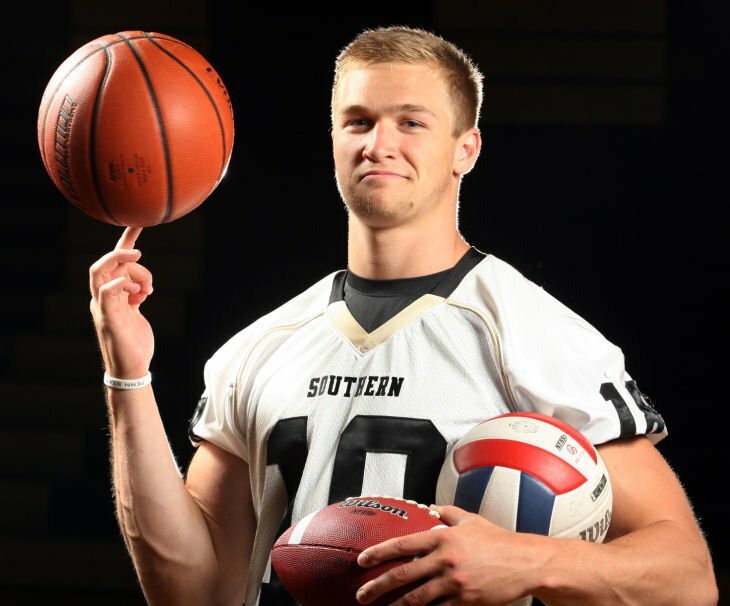 Gesicki, 18, graduates high school as Southern's career scoring leader in basketball, its career leader in blocks in volleyball and its career leader in football receiving yards. He led the Rams' volleyball team to its second straight state title this spring. Gesicki is The Press 2013-14 Male High School Athlete of the Year. He literally soared above his competition. His leaping ability set him apart in every sport and made him one of the most exciting high school players to watch in New Jersey. "I was able to break records in every single season I played in," Gesicki said. "That shows my hard work and dedication. It also shows the great teammates I played with and the great coaching I had. I had a lot of success with all three programs and I wouldn't trade it for the world." Gesicki lives in Manahawkin with his parents, Mike and Donna. He is the youngest of three children. His older sisters - Ashley, 24, and Kelsey, 21 - both played volleyball for Southern. In a telephone conversation last week, Gesicki talked about a number of topics, including which is better - catching a touchdown pass, dunking a basketball or spiking a volleyball. On how he started playing sports: I've always been around sports. I'm the youngest kid in my family. I have older sisters, and they played basketball. I used to follow my dad into practice, grab a ball and just kind of run around the gym. I just loved the whole experience of sports. I can't imagine my life without it. On his attitude toward sports when he first arrived at Southern: I was all about basketball. I was basketball seven-days-a-week, 24-hours-a-day. I was thinking about quitting football. I didn't know I was going to play volleyball. A lot of things were up in the air. I eventually stuck it out with football - thank God I did. And then I made the decision to play volleyball. That's the best decision I made in my high school career. I played for a great program, played for a great coach (Eric Maxwell) and won two state titles along the way. On when he realized he had tremendous leaping ability: Probably my eighth-grade year when I got my first dunk in a middle school basketball game. I got a steal. I barely got it over the rim. I pulled down the rim a little bit. It was the first of many dunks, and that's when I realized I could get up in the air. On dealing with the grind of playing three sports: I'm a huge competitor. I live for big moments. I live for the long season. I love staying after practice to work out until 7 p.m. It's something I've always done. It's all about mental toughness and telling yourself, 'I'm not tired.' You have to keep moving ahead and working harder than the next guy. Those are the things I've always told myself. On which is better - a touchdown catch, a dunk or a kill in volleyball: From September to late November, I love to catch touchdowns. From December to March, I'm dunking the ball. From March until early June, there's nothing better than getting a spike on the court. I really don't have a favorite sport. It's only what's in that season. I can't put my finger on one thing that's been better than the next because it's all been so great. On his future at Penn State: There's nothing that I'm more excited for than playing a Division I sport before thousands of fans on national television. But before you do all that stuff, you have to put the work in. I can't wait to start working out with the team, start throwing and catching with the quarterbacks and get acclimated into the team. It doesn't get much bigger than Penn State football - 107,000 fans screaming and yelling in the stadium. I know how hard I'm going to have to work to make these dreams I've always talked about come true. On what he does to relax: When I'm done practice, I'll go into the weight room and work out. I'll come home, shower and hopefully have some dinner cooked up for me. I have some good friends of mine that I'm always hanging out with that I also played sports with. When I'm not on the court, the field or the weight room, I'm just an average kid, enjoying myself. Emily DeMarco describes herself as a St. Joe "lifer." 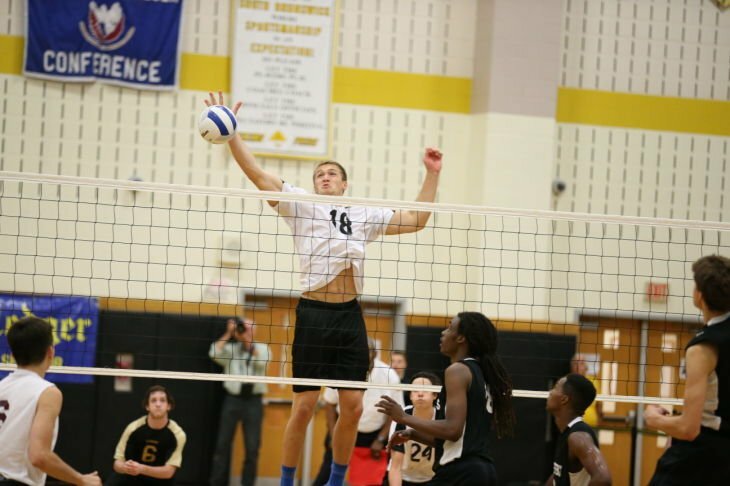 25-22, 25-20 win over St. Joseph of Metuchen in the June 6, 2013 state championship match at South Brunswick High School. 25-27, 25-17, 25-14 to win their second straight state volleyball title on June 5. 3. Becomes known for dunks: Gesicki shows his athletic ability as a sophomore in a Jan. 10, 2012 basketball game against Toms River North. Gesicki dunks four times during Southern’s 56-46 win, including a reverse that caused his teammates to jump off the bench. 4. Near-upset of Atlantic City in basketball: Gesicki wows basketball fans at Atlantic City as a junior on Feb. 28, 2013. He scores 24 points, grabs seven rebounds and blocks five shots as the Rams nearly upset defending state Group IV champion Atlantic City, losing 61-56 in the South Jersey quarterfinals. Gesicki brought the crowd out of its seats with several acrobatic dunks. 5. Group V football playoff run: As a junior, Gesicki catches three passes for 92 yards as Southern defeats Eastern 30-27 in the Nov. 30, 2012 South Jersey Group V semifinals. Gesicki follows that performance by catching seven passes for 122 yards and a touchdown as the Rams fall to Williamstown 43-20 in the Dec. 7, 2012 championship game. 1,866: The number of career basketball points he scored — No. 1 in Southern history. 20.3: Gesicki’s basketball scoring average this winter. 103: Number of football catches Gesicki made during his high school career — a Southern record. 1,817: Gesicki’s career receiving yardage — also a Southern record. 519: Number of blocks Gesicki had during his volleyball career — a school record. Emily DeMarco and Mike Gesicki led their high school sports teams into big games against the best competition in New Jersey.